This is probably the rarest disc on Lionel Whitfield’s label – just pipping the brilliant Merle Spears. Judging by the number I would guess this absolute unknown is his very first 45 release. 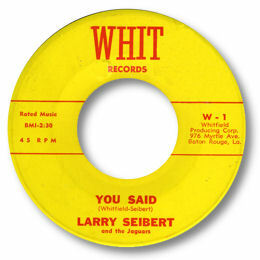 You Said is a splendid deep soul offering with Seibert coming across strongly over a horn-rich backing, complete with some neat touched from the lead guitar. I don’t know of any other releases by this guy. Larry told me he played “with Raful (Neal) in the early 60's. I was in New Orleans when Bobby (Powell) signed with Whitfield. Merle Spears was on the label he was a nice guy. Also, I did shows with Joe Tex and Larry Williams. In the mid 60's I was living in New Roads, Louisiana after I got married June 17,1965 and my brother asked me to come and stay with him until I got a place of my own. While in New Orleans I did work with singer named Eddie Bo. I had music to record between 1966 and 1967 but we never had the chance to do it. I stayed in New Orleans where I am today. I sung with some local bands in the 1970's but never got back into music because I started a family and with young children with music would be too time consuming. Since then I was an entrepreneur in the city of New Orleans until 2005 when I retired." I’m very grateful to Larry and Stacey for all their info and wish Larry all the best for his upcoming CD. Can’t wait to hear it!